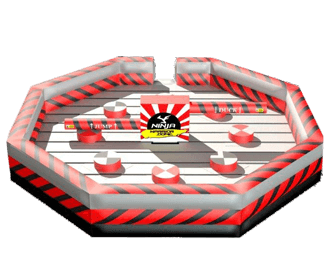 Check out the brand new 8 player Ninja Warrior Meltdown game from KIDZPLAY EVENTS! Two giant padded booms swing around and you need to jump and duck over and under them to avoid the Ninja Warrior! Do you have the courage to step into the ring and face the Ninja Warrior! Duck and jump over the swinging arms as they speed faster and faster and change direction! Great for any school carnival, large event or just a reason to have fun! Rent this amazing new ride from KIDZPLAY today!